The Lake District is Englands largest National Park and is now a World Heritage site. The area of north west England is regarded as one of the most picturesque in the country. The area boasts the largest mountain in England, Scafell Pike and the deepest lake, Wast Water. The many lakes of the area are adorned by quaint villages and it is a pleasure to cruise around the lakes aboard the plentiful boats in operation. 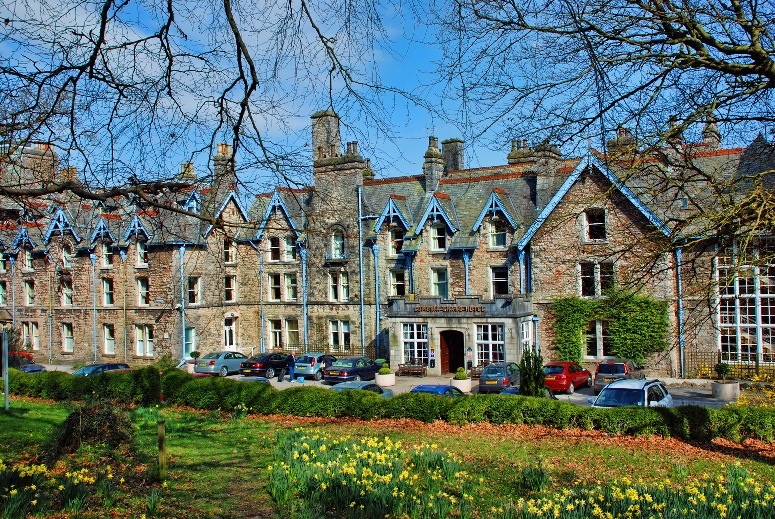 The Cumbria Grand Hotel was built in 1880 and is located just a short drive from the majestic Lake Windermere. Set in 20 acres of private gardens and woodlands and overlooking Morecambe Bay, a warm welcome awaits. The hotel boasts 124 bedrooms all with en-suite bathrooms, TV, hairdryer, direct dial telephones and tea/coffee making facilities. DAY 2 – FirAn excursion to Coniston Water which is the third largest lake in the Lake District at five miles long and half a mile wide. Coniston Water was the scene of many attempts to break the world water speed record. On August 19th, 1939, Sir Malcolm Campbell set the record at 141.74 mph in the Blue Bird K4. We enjoy a rather more sedate cruise on Coniston Water before visiting Ulverston for a couple of hours, the birthplace and home town of Stan Laurel. DAY 3 – Today we have a plethora of things to do, first the Lakeland Motor Museum, a fascinating collection of some 30,000 exhibits tracing the development of road transport through the 20th Century, then a short trip to the Lakeside & Haverthwaite Railway where a steam train awaits to take us to Lakeside and transfer for a relaxing boat cruise on Lake Windermere to Bowness where we spend a couple of hours exploring or relaxing by the lake before returning to our hotel. DAY 4 – A day out to Ravenglass where La’al Ratty awaits to take us on a train journey through seven miles of the Eskdale Valley to the foot of England’s highest mountain at Dalegarth. There is a 45 minute break here before returning and boarding our coach again to spend the afternoon at Muncaster Castle with its Hawk & Owl centre, gardens and breathtaking views out to Scafell Pike. DAY 5 – Friday has sadly come and it’s time to head home at the end of a spectacularly scenic and memorable holiday. Cumbria, one of the most sparsely populated and most northern counties in England, was formed from the old counties of Cumberland, Westmorland, part of North Lancashire, and part of North Yorkshire, and is now England’s second largest county in size. It is best known for containing the lake District National Park, containing England’s highest mountains and some of England’s largest lakes. Cumbria also is home to a small part of the Yorkshire Dales National Park. Cumbria’s history is characterised by invasions, migration, and settlement, as well as battles and skirmishes between the English and Scottish, as is evident by the many castle throughout the county. The county contains the Eden Valley, part of the North Pennines are of outstanding natural beauty, the western end of Hadrian’s Wall and some 180 miles of coastline along the country’s west coast. Shap Wells was opened in 1833 to serve the growing numbers of Aristocracy coming to take the waters of the Shap Spa located in the Hotel grounds when under the ownership of the Earl of Lonsdale, including HRH Princess Mary. During the second world war, Shap Wells was requisitioned as a POW camp for senior Luftwaffe and German Naval Officers. In 1962 after a period of decline, the building was purchased and turned into the fine building it is today. Being surrounded by open and wooded countryside many red deer, red squirrels and other wildlife often appear within the grounds of the hotel. Many of the rooms have breathtaking views of the surrounding countryside and fells, offering a true taste of the English countryside. The hotel has retained many of its original features over the years and much time has been taken it retain the true character of the building. Free WiFi is available throughout the entire hotel including all public areas, and guest accommodation. The 98 recently refurbished bedrooms are designed to suit the requirements of the modern hotel guest with comfort stops and convenience in mind. All bedrooms are equipped with TV, alarm clock and complementary tea and coffee making facilities.